Our solution is called the ARTAS® system and it uses the most advanced technology you can find in hair restoration. Unlike other types of hair transplant procedures that involve the use of scalpels and sutures, ARTAS® is minimally invasive and most patients report little to no pain. ARTAS® uses a robotic arm, which makes it more accurate than similar procedures which use a hand-held device. RHRLI is the only hair loss treatment center on Long Island that has ARTAS®. We want to tell women how our robotic technology can help with their hair loss. Hair transplant procedures have evolved from plugs, to strip surgery to Follicular Unit Extraction (FUE) surgery for men but, for a long time, women didn’t think about hair restoration procedures as an option. Before these latest advances, “a lot of women didn’t think of it — they wore wigs or lived with it,” Dr. Michael F. McGuire, of the American Society of Plastic Surgeons, told the New York Times in 2009. Are Women Good Candidates For Hair Transplant? 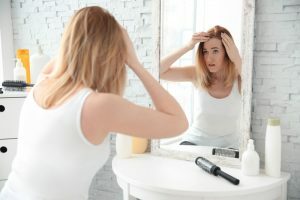 Women have been undergoing hair transplant procedures more and more since 2000, but the American Hair Loss Association, notes that many women aren’t necessarily good candidates for hair transplant. Some of the conditions that cause their hair loss are only temporary. Another issue is that women lose hair differently than men. They have what’s called diffuse hair loss, and can see thinning hair on all parts of the head, including the back and sides of the head, which are the prime donor areas for men. In order for a hair transplant to be successful, you need to find donor follicles that are not affected by DHT which shrinks hair follicles. There are women who are good candidates for ARTAS® including those who have a distinct pattern of hair loss similar to male pattern hair loss. Some women who lose hair due to non-hormonal conditions like mechanical or traction alopecia are also candidates, as are women who lost hair because they are burn victims or scarred by an accident. Women who’ve had previous cosmetic surgery are concerned about hair loss around the incision site. If you’re a woman concerned about hair loss, come to RHRLI. All of our patients consult with our board-certified surgeon Baiju Gohil, MD. He will design a hair loss treatment plan for you and let you know if you’re a candidate for the ARTAS® procedure. Contact us today. Previous Post: « What is Recovery from a Hair Transplant Like?